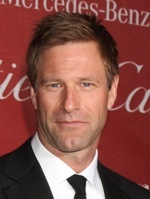 Just days after word broke that Aaron Eckhart would be playing the lead in the upcoming I, Frankenstein, ComingSoon.net had a chance to sit and speak with the actor at the junket for his latest, The Rum Diary. They'll have the full interview available soon, but here's what he had to say of his casting in the graphic novel adaptation. "Somebody says, 'Do you want to play Frankenstein?' and I was like, 'Well, I haven't thought about it," Eckhart laughed of the role coming his way, "Then I read the script. Whenever you read a script that you want to do, you start feeling yourself in that character. All of a sudden your juices start flowing. That's how you know you should do a movie. Now I'm gonna be Frankenstein and I'm kind of worried about it, actually. I've gotta go and figure out how the hell I'm gonna play Frankenstein." Set to begin filming in Australia in January, the film tells the modern-day tale of Dr. Frankenstein's creature, Adam, who nearly centuries after his "birth", has found himself in a gothic city, caught up in a war between two immortal clans. Though based on the comic by Kevin Grevioux, Eckhart explained that Mary Shelley's original novel is where he's currently focusing his attention. "Oh yeah," Eckhart replied when asked if the role was planned to be make-up heavy, "…[But] I think bolts came later. I'm not finding bolts in Mary Shelley's 'Frankenstein.' I think all that sort of stuff is an invention of Hollywood. I don't know where it came from. Even the lightning isn't a big part of [her book]. 'Frankenstein' the book deals more with the subjective. The feelings of the creature and less about the making of." I, Frankenstein is planned for release on February 22, 2013 while The Rum Diary arrives in theaters this October 28th.